I have tracked nearly 40 soldiers since 2006 who have been diagnosed with rare, aggressive forms of cancer post-tour. Half have already died. As early as 2007, four years after the war in Iraq, the medical journal Lancet Oncology observed a trend: that several cancer registries were being locked out of Veteran's Administration [VA] data beginning late 2004 (a year after the war in Iraq). For decades the VA had voluntarily shared its data, allowing access to cancer patients. A Centers for Disease Control spokesman said that as a result of the lock out, "Potentially, 40 000 to 70 000 cases were missed nationally each year." With the national estimate of cases askew, the spike in cancer rates of soldiers being diagnosed with cancer post 2003 deployment -- remains unreported. I have tracked nearly 40 soldiers since 2006 who have been diagnosed with rare, aggressive forms of cancer post-tour. Half have already died. The DoD and VA are less then forthright about this pattern --even as they approach the seventh anniversary of the war this March. The environmental culprit, depleted Uranium and most recently the carcinogenic smoke from burn pits (the military's resolve of disposing their sanitation in landfills---is burning the refuse, no matter what the content, in acre size dirt pits). The United Nations Environment Programme has been conducting measurements of DU sites in Kosovo since 2000, later including Serbia, Bosnia, Kuwait and Iraq (the latter to be found with 42 contaminated sites). Their "Depleted Uranium Awareness" pamphlet admits there is a DU concern --but down-plays the cancer risks. DU is unable to penetrate the skin, but once there is inhalation or ingestion of the radiological DU dust, its toxicity has the ability to radiate the lungs and gut (multiplying in the cells). Their projected time frame after exposure is 10 - 20 years before symptoms appear. But that is far from the truth, as soldiers lay ravaged in VA hospitals across the U. S. -- or their family's, kneeling at the foot of a needless grave, know all too well. Privy to the VA data since 2003, the DoD is familiar with their diagnosis of an uncontrollable wildfire of rare cancer, appearing four to 36 months after exposure. It is abhorrent that the DoD and mainstream media has stood shoulder to shoulder with locked arms blocking this information from the masses -- military and civilian -- in fear of soldiers deflecting. Especially when protective masks, gear and literature is readily available but intentionally withheld. But is death the only option? The young widow of Army Command Sergeant Major [CSM] James W. Hubbard Jr., [pictured throughout] with the 139th Medical Group Unit in Independence, Missouri, shares his story below. The strapping Georgia native was drafted in 1972, a mere 20 years of age the autumn he enlisted. 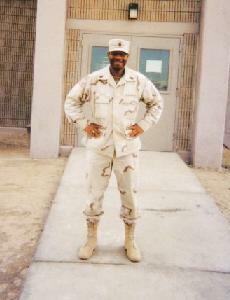 He was happy to leave Georgia, knowing the military would create opportunity that he wouldn't have if he stayed. It instilled a sort of pride in him. It afforded him the ability to travel the world, he toured Egypt twice and lived in Germany for three years. He eventually returned to school where he earned his BA in Criminal Justice. By 1980 the dedicated Army soldier decided eight years of Active Duty was enough and transferred into the Army Reserves. Year after year of superior military service he edged his way up in ranks to Command Sergeant Major, a rank that was the highlight of his career, and a proud accomplishment. But with such honors comes much commitment and before long he received orders to deploy to Iraq. Fit for duty, the extremely active CSM Hubbard was in excellent health, never even needing an aspirin, and in preparation trained at Ft. Riley, Kansas. 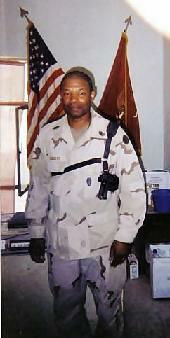 As the war in Iraq commenced February 2003, he deployed from the 450th Movement Control Battalion out of Kansas with Operation Iraqi Freedom. His battalion landed in Iraq and forged ahead to their base camp at Talil Air Force Base (it's been reported that Talil has one of the largest burn pits, 50-acres in size). From there he spent the next 13 months traveling throughout Iraq, visiting his soldiers a few days at a time at the many camps they called home. His health remained good, adrenaline keeping any possible issues at bay. His tour ended March 2004, the arduous, year long stint was finally behind him. And like every soldier returning home he underwent routine blood work. Except his results were unusual and he was directed to a civilian doctor, who referred him to a blood specialist for follow-up testing and blood monitoring. He returned to the civilian job he'd been at since 2000, as a Sergeant at the Department of Correction in Kansas. And within a year he met Katie, his young and beautiful future wife. Life was great. "According to my husband, they just monitored his blood without further testing and sent him home," his wife Katie Hubbard recalled. "During the summer/fall of 2005 he began complaining that he couldn't run like he was accustomed to. He would tire more easily and his workouts weren't the same. He also started gaining weight." Over the next two years they planned their wedding. As a sports lover he watched the Atlanta Falcon's and the University of Georgia Bulldogs play as much as he could. And with his wife to be shared his passion for war and Sci-fi movies, a collection of WWII figures, and introduced her to the soul of romance through the silky sounds of Motown music. CSM Hubbard's initial routine blood work turned into a flurry of do-overs in a five day period, at which point they finally disclosed that 'his blood levels were critically low, and may need to be admitted for further testing.' They Urged him to schedule an appointment with the hematology department. Within two days he sat before Dr. Chester Stone, a hematologist, who informed him that 'his levels were low, but not critical.' "He thought that James either had a parasite or Leukemia, but didn't think it was acute. Inferring that if it was Leukemia, it wasn't the "bad kind." So he scheduled a bone marrow biopsy the following week, and ordered another CBC count," Katie said. The biopsy was botched the first time, so they re-drilled to retrieve the piece of bone marrow they weren't able to obtain initially. The doctors decided to include a series of genetic testing with the sample. Leaving the Hubbard's anxiously awaiting the results for three weeks. By mid November 2008 they met with the doctor. Expecting Chronic Lymphocytic Leukemia if it was cancer, but hoping for a parasite or something easily treated. "We arrived and the doctor said, 'It's Leukemia.' Adding, 'It's a rare form and we can't be certain if it's Acute Lymphocytic Leukemia or Bi-Linagal Acute Myelogenous Leukemia.' I was stunned. It was a blow to hear," Katie admitted. 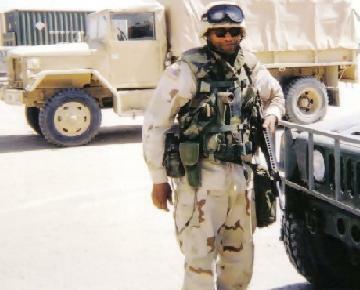 "They believed James' Leukemia was from his service in Iraq." Dr. Stone urged them to move forth with testing and enter into a Transplant Center as CSM Hubbard needed a bone marrow transplant within a year. He saw three doctors before it was confirmed as Acute Lymphocytic Leukemia [ALL], with 85 percent Leukemia Blasts in his bone marrow. 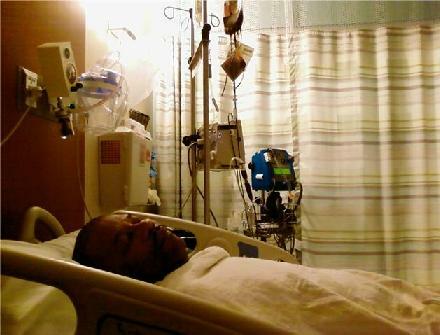 In January 2009 his chemotherapy port, a Hickman Catheter was placed. The Chemo started February at MD Anderson Cancer Treatment Center. "The Kansas City VA was to do his treatment, but the doctors there were not only horrific, but unknowledgeable and disrespectful," Katie recounted. CSM Hubbard's Commander was very supportive inviting the Hubbard's to stay with he and his wife during one of the cycles, continuing to visit him in the hospital. "Both his Colonel and Brigadier General are doctors in the civilian world," she informed. "His Brigadier General kept in close communication with him out of concern. His Colonel stated there was no explanation for the type of cancer James had for his age. And was puzzled as to where he could have gotten it. Adding that, 'It's normally a young adults or children's cancer.' "
Mrs. Hubbard confided, both she and her husband believed the cancer was from his exposure to the bounty of chemicals and depleted Uranium while deployed to Iraq. "In 2003, his unit entered immediately after the Iraqi's left the area. With the blown up tanks and utter destruction who knows what toxins they were subjected to." Revealing, "There was at least one other person from his unit that had Leukemia post deployment." Still with all the obstacles and challenges they faced in this tragic unexpected circumstance, CSM Hubbard remained optimistic about the future, often talking about his plans post treatment. "His main goal was to enjoy our new house and get back in shape." 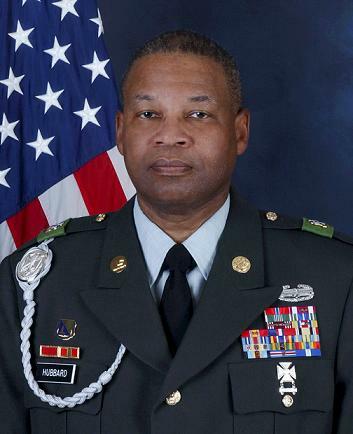 So he decided to retire as Group CSM, forfeiting the opportunity to advance to Brigade Command Sergeant Major, a role he held twice during the interim between Iraq and Kosovo tours. She noted his chemo treatment during the odd cycles affected his PTSD. "He was extremely moody and short tempered. The even cycles made him more tired and took a day or two longer to gather his strength back." In all, "James was beating the cancer and was in clinical remission after round two. The first few cycles at MD Anderson went good and he was treated well," she reported. "But the doctor was aggressive and wanted to get the last remaining residual blasts (0.65 percent) out. She wanted the counts to be 0.00 percent. He was to undergo another bone marrow biopsy prior to cycle five. That one would have told us if a bone marrow transplant was necessary." It had been six months since his diagnosis. With hope in their heart after round four the Hubbard's left the hospital for a much needed break. They left Houston and drove back home to Leavenworth, Kansas. 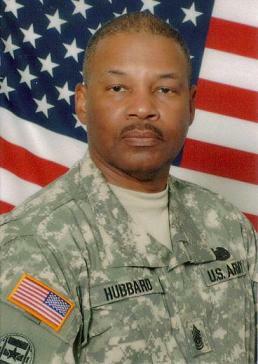 CSM Hubbard's body, tired and beaten from three months of aggressive treatments and chemicals---almost knocking the life out of him---just wanted to go home with his dedicated wife and recoup. Within two days their hope had vanished as CSM Hubbard had developed explosive bouts of frequent diarrhea. Katie Hubbard had been advised by his doctors before leaving the hospital to administer the over-the-counter remedy, "Imodium." "After I cleaned him up he was sitting up on the bed. I walked away and when I looked back I saw that he fell over onto his side. I went back to the bed and laid beside him, and as I started asking him how he felt I noticed his eyes were as big as half dollars," she exclaimed. "I knew something was wrong so I called 911 and he was taken to the ER in Leavenworth, Kansas. They wouldn't allow me to ride with him, so I jumped into my vehicle and followed them to the hospital," she said with frustration. "I stood by as they carried him from the ambulance, wheeling him to the ER. James squeezed my hand when I told him I loved him, and not to leave me. I assured him I was there for him," she wept. "Then the EMS insisted I register him and barred me from his side while they performed CPR. Before long, the doctors returned, only to callously announce his death." "James ultimately died from a reaction to the antibiotic, "Vantin." During his last cycle of chemo his doctors didn't listen when I explained his symptoms, they instructed me to treat it with "Imodium." Their unwillingness to listen ultimately caused his death," she said angrily. "He was just completing the therapy in round four and we were waiting to start round five when he died," she mourned. Without medical explanation, she assumed his potassium levels may have dropped dangerously low from the severe diarrhea, "But we'll never know because St. John's Hospital ER didn't order the blood work," she cried. His Colonel later said to Mrs. Hubbard, 'You don't cover-up the symptoms by treating them with Imodium.' Online she read, 'moderate to severe diarrhea' is one of the side effects of an 'adverse reaction' to the antibiotic. On May 21, 2009, at the age of 57, after 36 years, 6 months, and 27 days in the military, CSM James W. Hubbard Jr's, father and brother beckoned him from the gates of heaven, calling the courageous, dedicated soldier home. There was no chance for final wishes, as he died suddenly and unexpectedly---alone. His two sons from an earlier marriage, a grandson, five sisters, and mother had not been given the chance to clutch his hand, and squeeze away the fear of the unknown, nor rest their eyes on their beloved's face one last time. The mistaken prognosis of a 90-95 percent chance of survival had evaporated---into the ethers along with his spirit. Suffering no longer---his hopes and dreams of what could have been lay buried at Leavenworth National Cemetery. The evidence---another witness who's suffered the toxic environmental secrets of the U. S. military in Iraq---is lost. All because of the DoD's failure to provide the troops with preventative measures to fight the invisible enemy known as radiation. Without caution, we enrage over an unborn fetus at an abortion clinic, but when it comes to our soldiers---without conscience---we fall deaf and blind. Heavenly Father help us for killing our own---while cloaked in patriotism, we have become, the Weapon of Mass Destruction. 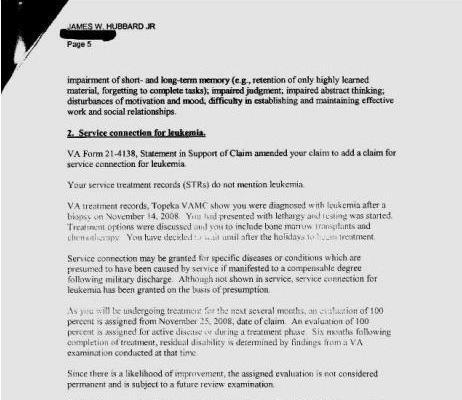 CSM Hubbard's VA letter admitting the cancer wes related to his tour in Iraq. More than 40 sites across Iraq are contaminated with high levels of radiation and dioxins, with three decades of war and neglect having left environmental ruin in large parts of the country, an official Iraqi study has found. Areas in and near Iraq's largest towns and cities, including Najaf, Basra and Falluja, account for around 25 percent of the contaminated sites, which appear to coincide with communities that have seen increased rates of cancer and birth defects over the past five years. The joint study by the environment, health and science ministries found that scrap metal yards in and around Baghdad and Basra contain high levels of ionizing radiation, which is thought to be a legacy of depleted uranium used in munitions during the first Gulf war and since the 2003 invasion. The book outlines environmental problems and legal implications of the contamination of Iraq due to the use of depleted Uranium in military weapons used during the Gulf Wars. The military use of uranium has the potential to be a serious contributing factor to the illnesses besetting the Iraqi population. The authors address the concerns surrounding the changing health patterns in Iraq since 1991 and, in particular, the increase in cancers and genetic birth defects amongst children.